Solar panels are the next granite countertops: an amenity for new homes that’s becoming a standard option for buyers in U.S. markets. At least six of 10 largest U.S. home builders led by KB Home include the photovoltaic (PV) devices in new construction. According to the Solar Energy Industries Association, demand for the home PV systems will jump 56 percent nationwide. SunPower has supplied solar for more than 10,000 U.S. homes, including 4,000 built last year in California, the biggest solar state. Tom Werner, CEO of San Jose, California-based SunPower says, “You embed it into your home mortgage, you’re cash flow positive month one,” he said. That’s similar to how home buyers decide to pay $5,000 or $10,000 for a granite kitchen countertop. Even in Ohio, there is a market for integrating solar in new home construction. 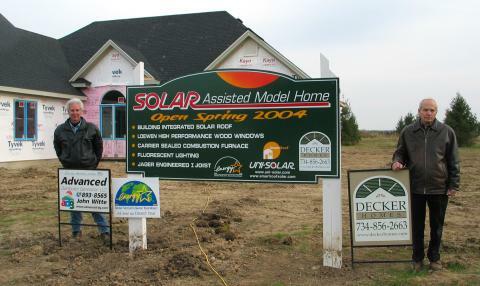 Decker Homes has been building model homes in Northwest Ohio with solar PV systems. (See photo below, courtesy of Decker Homes). We are a corporate responsibility and sustainability consulting firm located in Cleveland, Ohio.